Girls, it's almost time! In celebration of the new season of the Drag Race, I've put together some new work featuring all fourteen queens! 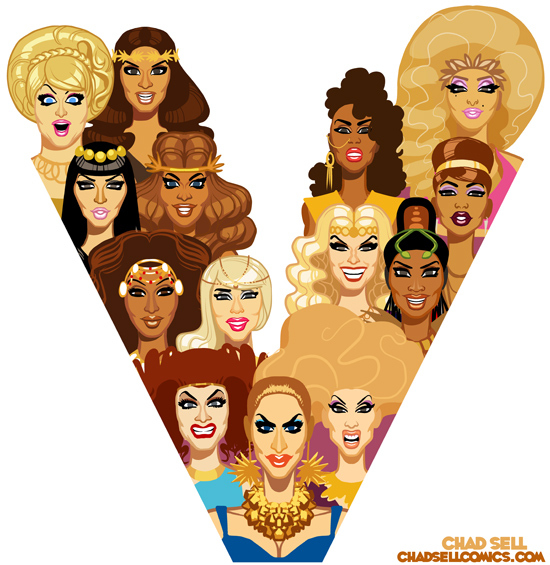 I've assembled this poster of all the queens, and I'm making it available (for free!) in all sorts of different sizes in case you want to use it as a wallpaper on your phone, tablet, or computer! Click below to get the image formatted for your phone, tablet, or whatever! Check out my drawings of each individual queen from Season 5 here, and as always, I have a ton of other DRAG RACE prints and books for sale right here! Get all your favorite queens: Sharon Needles, Raven, Jujubee, Chad Michaels, Latrice, Manila, Raja, and lots more! So, you know. Check it out! If you're dying for more Drag Race excitement, check out Logo's "Meet the Queens" videos for a sneak peek at some of this season's most colorful personalities! And here are some of my favorite videos of the queens that I've stumbled across while stalking researching them! Stay tuned! I'll be posting portraits of my favorite queens from the first episode next week!